I just started my run. My test was in a few days. My head was full of a lot besides medical jargon. Emotions of stress, anger, frustration, flooded my veins. So, naturally it was time to blow off some steam and run. Towards the start of my run, I could feel the adrenaline pumping. Then all of a sudden. I didn’t know what happened. Did I trip? Why was I on the ground? I looked at my hands and they were covered in blood. My right elbow was scraped pretty clean. My right knee had a gash as well. I had a choice at this point. Should I finish the two mile run, or head back home which would take a minute or two? So I did. And I ran the two miles. As cars passed me, they watched a guy running full speed with blood dripping from each limb. 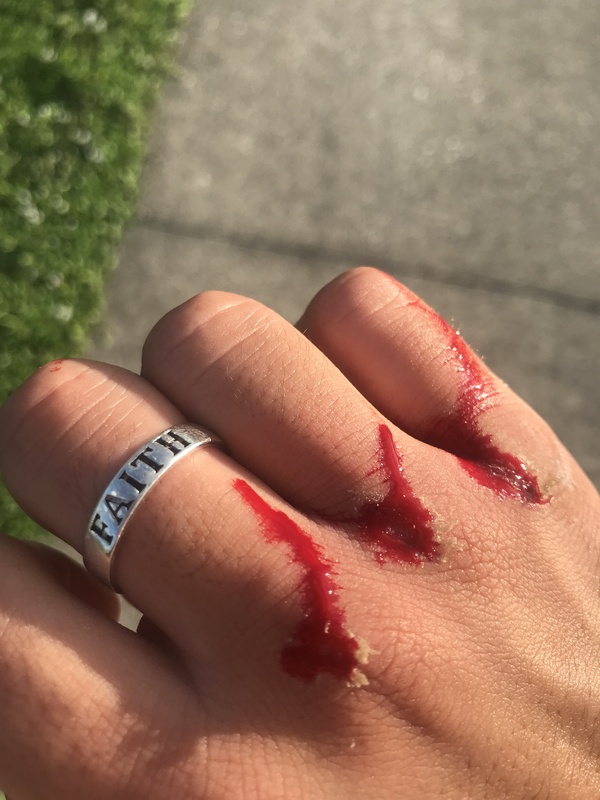 When I finished the run, I noticed how the blood dripped across the ring on my right hand that is the three theological virtues, “faith, hope, love.” It was a reminder that in order to live a Christ like life we must make sacrifices. I seem to notice the blood in my life a lot. The wounds, the scars, the trauma, and the fears become my focus. Because of this I stop running (living presently). I focus so much on the blood in my wounds that I end up not achieving my goal. I allow the suffering (bleeding) of the day to take lead and cause a pause in my pursuit. I am sure many of you experience the same problem. Our wounds become our identity and our only reality, so we forget the importance of the path we are on. We allow the devil to consume us in an inner dialogue that prevents us from loving those around us in the present moment. I want to encourage you to not let the suffering of this life deter you from running the race. Focus on Christ at the end of your journey and the pain will start to disappear. But these are wounds only Heaven can heal.